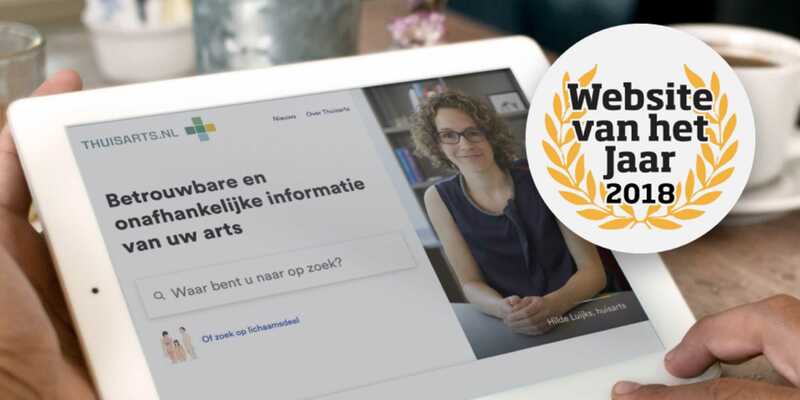 Health platform Thuisarts (GP at Home) is in the race for the Website of the Year 2018 Award. Thuisarts (GP at Home) was developed by the Dutch General Practitioners Association (NHG) in collaboration with creative & digital agency One Shoe. Each month more than 1.7 million people find reliable and independent information about complaints and illnesses on Thuisarts.nl. It's one of the most popular health websites of the Netherlands. Research in the British Medical Journal shows that the number of GP practices in the Netherlands has dropped by 12% as a result of the launch of the platform. The Website of the Year Award is presented each year to the best and most popular websites in the Netherlands. In 2016, Thuisarts won the award for the most popular Website of the Year in the Health category. This year, the Dutch public can vote on his favorite websites until 19 October 2018. On Thursday 22 November, the best and most popular websites of the Netherlands will be announced during the annual Award Night of the Website of the Year election.